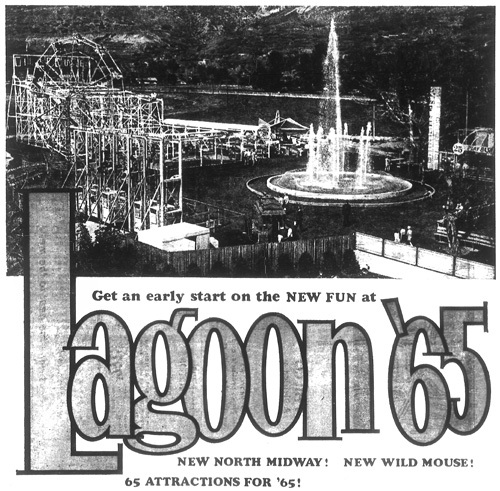 When Lagoon first opened in its current location, it was much smaller than it is today. New rides and attractions are being added almost every year, but eventually the size of the park needs to expand to accommodate everything, not to mention the added crowds that come to visit. One major expansion began in 1964 when 60 acres were acquired north of the park. A portion of Lagoon Lane (which used to run east to west along the northern boundary of the park) was closed and park offices were moved with the intent of some day hosting the Utah State Fair. The agreement was that Lagoon would take ownership of the land and the park would make improvements on the land. Some attractions were relocated, new ones were added and the area opened in spring of 1965. This expansion was so significant at the time that an entire section of the May 28th Deseret News was devoted to Lagoon. Many of the advertisements¹ in the section even included references to Lagoon and the new expansion. Here’s a look at each of the attractions in the area. Drawing of the new North Midway from the Deseret News. 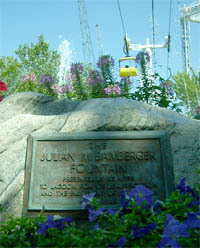 The centerpiece of the addition was a new fountain named in honor of Julian M. Bamberger. Son of Lagoon’s founder, Simon Bamberger, Julian took over operations of the park and the Bamberger Railroad after his father was elected governor of Utah. He remained the owner as the Freeds began leasing the park in 1946 until they bought it from Bamberger in the ’70s. The paper described the fountain as, “a 50-foot pool with sprays and jets that will shoot water 35 feet high accompanied with dramatic lighting effects”. A plaque can still be found on a rock sitting next to it which states the fountain was “presented by his wife to Lagoon for its beautification and the enjoyment of its patrons”. Added to Lagoon in the previous season, this may have been one of the relocated rides. 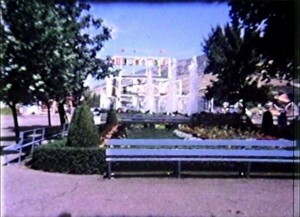 The Flying Swings were, at least in 1965, on the west side of the Midway not far from the Patio Gardens, roughly where Space Scrambler currently sits. This particular Ferris Wheel replaced an older one in 1953. It survived the devastating fire that November and has been moved a few different times, but has always been somewhere on the north end. It was permanently removed in 1990. 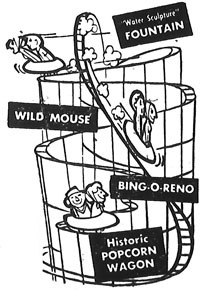 The major attraction was a Mack Wild Mouse which had previously been in use at the recent World’s Fair in Seattle. (The same World’s Fair for which the iconic Space Needle was built). The ride only lasted here a few years before being removed. Soon after it was rebuilt and improved on the South Midway. Originally opening at the park in 1961, this ride has also moved around quite a bit. In 1965, it was placed just east of the Wild Mouse, close to where the entrance to Jet Star 2 is now. Image from a May 1965 newspaper ad. 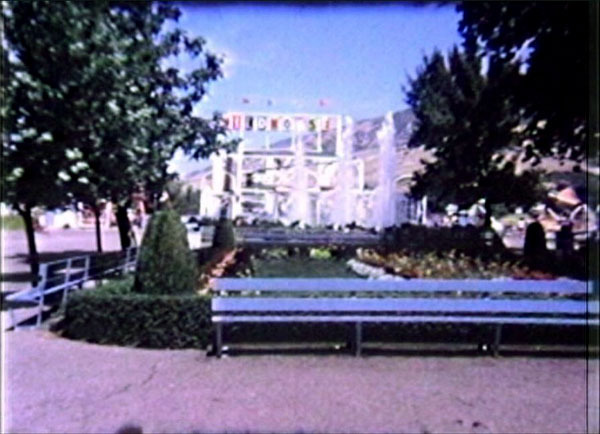 Hi-Striker, the classic midway game where participants test their strength³, came to Lagoon in 1964 and could be found next to the Basketball game in 1965. Both Hi-Striker and Basketball would have been moved when Opera House Square opened in 1968. There could also have been more than one different Hi-Striker before and after 1964. An electronic Hi-Striker was installed in 1995, but it wasn’t operating in the 2015 season. Instead, a much smaller, portable version called Rocket Launch was placed in front of it. An even smaller, kid’s Rocket Launch game opened south of the Gourmet Burgers & Chicken stand. A new electronic Hi-Striker with sound effects and a scrolling marquee replaced the old one in 2016. Allegedly, it was purchased from Knott’s Berry Farm and refurbished. Also known as the Basketball Toss, this game was introduced in 1964 as well. It’s very similar to the Slam Dunk game that exists today. The only mention of this game I’ve found is in advertising from May 1965. It might simply be some kind of variation on the game of Bingo. 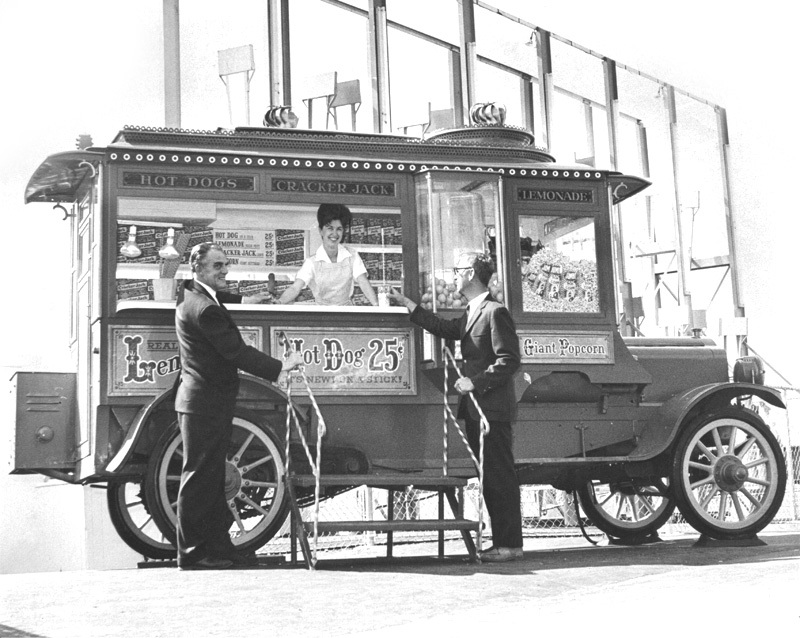 This antique popcorn wagon originally served hamburgers at 2nd East and 3rd South in Salt Lake City. These popcorn wagons were produced by C. Cretor & Co. around 1910. According to the May 1965 Deseret News article, it’s a 1907 White Motor Company truck which was “completely restored and rebuilt by Charles W. Cram of the Kimball-Cram Sign Company”. It was moved to Opera House Square when it opened in 1968 and can be seen on the left in the photo below. 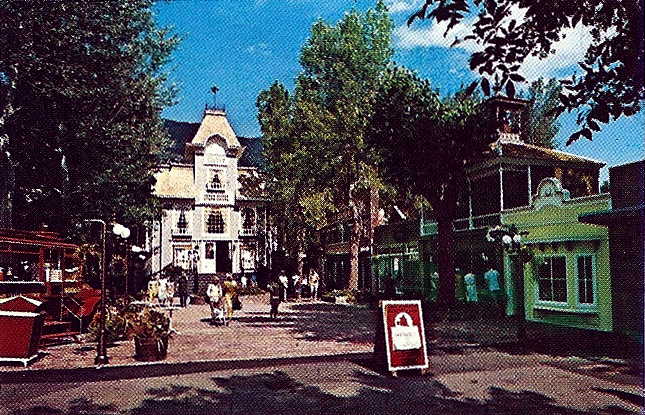 The next major expansion to Lagoon opened about a decade later when Pioneer Village opened on the east side of the park. 1. You can look through the special Lagoon ’65 section and see the special Lagoon-related ads from Broadway Music, Clover Club, Lynn Wilson’s, Felt Electric, Continental Bank, Mountain Dew, Hi-Land, Wirthlin’s, Anderson Lumber & AG Food Stores. The Felt Electric and Anderson Lumber ads both mention their services were used in the new expansion. 2. From the DVD Parks From The Past, Volume I available from Sharpshooters Productions. Used with permission. 3. Here’s an article from an issue of Popular Mechanics in 1935 which explains how High Striker games were controlled by operators to alter the results. Lagoon ’65. Deseret News, 26 May 1965. Arave, Lynn. Take a wild ride at Lagoon on new Wild Mouse in ’98. Deseret News, 5 Dec 1997. Lagoon’s Games. LagoonIsFun.com, accessed 8 Dec 2010. This is awesome. I’ve been looking for a shot of that ride for some time now.